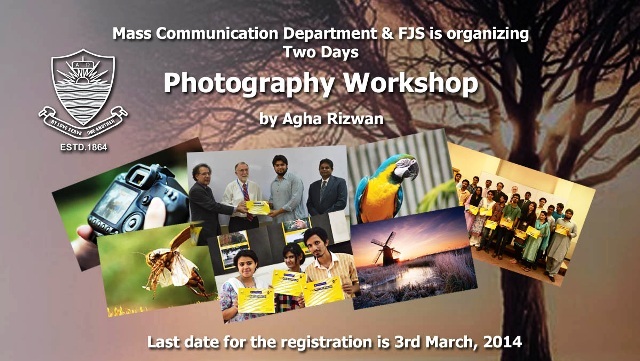 The Mass Communication Department along with the Forman Journalism Society (FJS) is going to organize a two-day photography workshop themed 150 years of FCC. 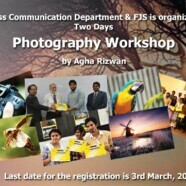 Nikon’s photographer Agha Rizwan will conduct the workshop. Chairperson Mass Communication Department Dr Mian Ahmad Hanan and FJS advisor Sehrish Mushtaq will be facilitating the workshop. All students are invited to participate in the workshops. Students with the DSLR cameras and prior experience will be given preference. Last date for the registration is 3 March 2014.